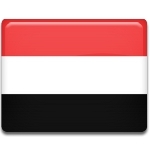 The national day of Yemen is known as Unity Day, Unification Day or Day of National Unity. It commemorates the unification of North Yemen and South Yemen that took place on May 22, 1990. North Yemen once was part of the Ottoman Empire. Following the collapse of the empire in 1918, it became independent as the Mutawakkilite Kingdom of Yemen. In 1962, Arab nationalist revolutionaries staged a coup and declared the Yemen Arab Republic. The coup sparked a civil war that lasted for eight years. South Yemen was a British colony. In 1967, the United Kingdom began to withdraw from its remaining colonies. In November 1967, South Yemen became an independent state as the People's Republic of South Yemen. Three years later, it was reorganized into the People's Democratic Republic of Yemen. Originally the relations between the two countries were relatively friendly. The first conflict occurred in 1972. During the following years, there were several short-lived conflicts. In 1988, the two governments came to an understanding and began discussion unification. The Republic of Yemen was officially created on May 22, 1990. This day is now celebrated as a national holiday. Unity Day is marked with speeches, flag hoisting, award ceremonies, parades, cultural events.